@SgtPeppersBulldog, I'd be interested to see you do a rendition of Roger Waters; I'll be drawing a portrait of him at some point today, of course. I don't think I could do one in time for today, but yeh I'm up for it! I'm currently working on the Stu drawing (I'm about a month late on this), so it will probably come after that. Roger is next, but I don't know who I should do after him. Maybe Dave? I've also decided to give Mixpad another chance, so hopefully, there should be musical projects in future! I'm assuming you mean David Gilmour? That'd be good. I'd also love to see David Bowie. I meant Gilmour, but now you've brought it up, I should do Bowie sometime as well! Wow, that's such a cool one! 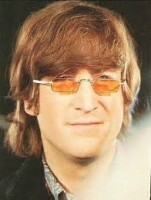 Uhm, since you said you didn't know whom to do next ... could you make a picture of John with his yellow sunglasses from the Paperback Writer promotional video once? I hope you can tell which one's pink which! 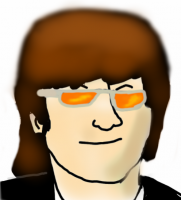 I was going to put Syd with them, but I think it's best that he has his own drawing sometime in the future. I will do one of @sir walter raleigh 's requests next (hopefully I'll do all four of your requests, Sir Walter (and everyone else's requests), but it's gonna take tiiiiiime, a whole lotta patience and time..! That is a great drawing of Pink Floyd @SgtPeppersBulldog! I was going to post this a few days ago, but I couldn't because of the whole situation with posting pictures. And don't worry, folks, the drawing requests are underway! 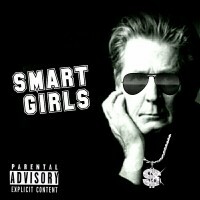 To everyone else, you will have had to heard the song to get the joke! I'm working on an actual Brian picture, as one of SWR's requests. Oh, I love that one as he looks even friendlier (and cheekier!) 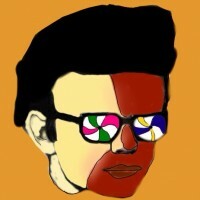 than in the original picture and the psychedelicness of the glasses is spot on! Cool work! Very nice @SgtPeppersBulldog! Your likenesses have improved, I think, and the colours and shading are also excellent. I love the way he's slyly peeking over his glasses. 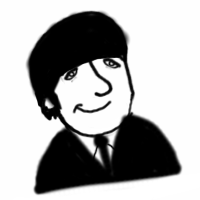 I'm thinking of doing a Beatley comic strip sort of thing for my next drawing, so watch this space! Oh, my god, I just wandered in here to see what was happening in this corner of the forum and I discovered this beautiful beatley art! I love it!